Historian Stephen Turnbull described Mongols as the “object of both admiration and loathing”. But beyond what chroniclers felt about them, there is the ‘wall’ of Mongol achievements in the fields of military organization that historians can’t disregard. In essence, it is not surprising that the Mongols went on to create the largest contiguous land empire in history; however, it is certainly fascinating if we take into account the rapid rate at which they accomplished such a feat. So, by putting on the objective lens of history, let us discuss the Mongols, the most powerful and organized warrior culture of the 13th century AD. Their [Mongol] chests, in color half-black, half-white, were covered with lice which looked like sesame growing on a bad soil. Their bodies, indeed, were covered with these insects, and their skins were as rough-grained as shagreen leather, fit only to be converted into shoes. Interestingly enough, the Mongol’s keen sight had been attested by various then-contemporary sources, with seemingly unbelievable claims. Some of them pertain to how a Mongol can make out an enemy hiding behind the scanty bushes of the wild steppes from a 4-mile distance, while also having the incredible capacity to discern between man and beast from an 18-mile distance. Such apparently exaggerated claims surely had some basis on the strong visual memory exhibited by the regular Mongols. To that end, most soldiers from the Mongol army were required to know their surroundings well that could aid in scouting and foraging. Moreover, they were also expected to have a great deal of knowledge about the local weather conditions, vegetation, grazing lands and most importantly water supply. As a Mongol child’s age crossed the threshold of three years, it was his mother’s responsibility to teach him to ride horses. One of the preliminary exercises involved the child to be tied to the horse’s back, so as to prevent any accidental injury – which certainly gives us an indication on how fast the horse was trained to run. After a year or two, the Mongol child was finally presented with his bow and arrow, and his lifelong pursuit as a hunter and a warrior effectively started from that period. In fact, he was expected to join in military campaigns by a very early age (sometimes at fourteen, possibly as rearguard for protecting supply lines). He was also expected to sleep in his saddle when the need arose, thus alluding to stoical hardship of the nomadic equestrian society. Talking of hardships, Marco Polo once commented that the Mongols could supplement themselves with any kind of animal ‘flesh’ while on campaigns, but mostly partook meat, mare’s milk and game animals like Pharaoh’s rats (marmots). Other writers, like William of Rubruck, talked about how Mongols could subsist on most types of animals in their herd, by naturally drying their meat. Additionally, they also made unsalted butter and curd from cow’s milk which was hardened and then consumed while on campaigns. Their military-provided rations were also frugal – with just dried milk curd (that was mixed with water and drank as a thin-watery yogurt), cured meat (which was further tenderized by keeping it under the saddle) and ‘kumis‘ (an alcoholic beverage made from fermented mare’s milk). But the most probable source of food (when hunting was not possible) must have pertained to the horses themselves. 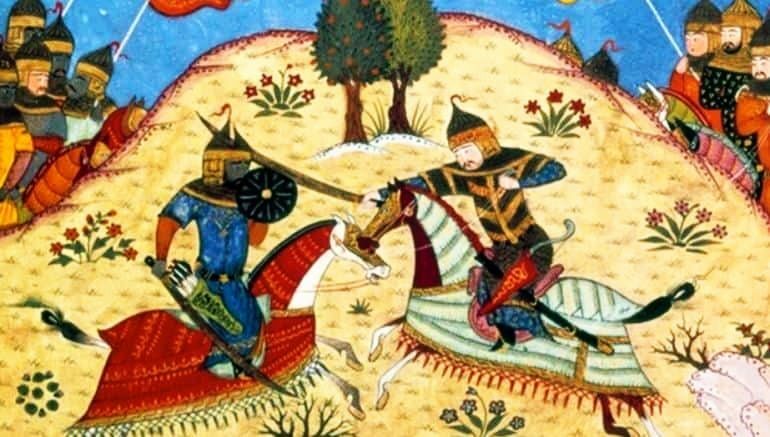 A 13th-century Armenian historian named Kirakos of Ganja (who was imprisoned by the Mongols and later became a secretary for them) possibly gave a first-hand view of the eating habits of the Mongol warriors – and he said how a single healthy pony could provide daily meat rations for hundred men. Marco Polo also talked about how some Mongol riders practices bloodletting on their horses in possible emergency situations. The horse’s blood could have proved to be nutritious in short spurts during dynamic military campaign situations. It is an army after the fashion of a peasantry, being liable to all manner of contributions and rendering it without complaint whatever is enjoined upon it…it is also a peasantry in the guise of an army, all of them, great and small, noble and base, in time of battle becoming swordsmen, archers, lancers and advancing in whatever manner the occasion requires. Simply put, the Mongols didn’t really differentiate between a civilian tribal member and a soldier – he was one and the same. And we stretch this latitude a bit, the Mongol army was simply the society (or at least a part of it) that had gathered on a war footing. This collective nature of aggression was a hallmark of many nomadic cultures, but the Mongols arguably nigh perfected the scope through their logistical and organizational skills. In fact, this ingrained perception of warfare is rather mirrored by how the ordinary Mongol soldier was not paid during the time of Genghis Khan. Rather, the trooper had to make payments (in possible contributions) to their immediate commanders. This sort of ‘reverse’ payment was known as qubchur. Now the contributions in question here probably pertained to the loot that was shared among the soldiers of a battalion, with increased values being allocated among the higher ranking officers. In other words, plunder and booty became the basis of payment (and thus income) among the common Mongol soldiery, at least during the initial phases of their conquests. And more interestingly, it seems that most of the Mongols preferred this mode of distribution without fixed income since there was no limit to the plunder acquired during particularly successful campaigns over wealthy foes. Such was the organizational prowess of the Mongols, that in the 1220s, when Genghis Khan was commanding one part of his army in the vicinity of Afghanistan, another section of his army was operating in the vast expanses of Russia. 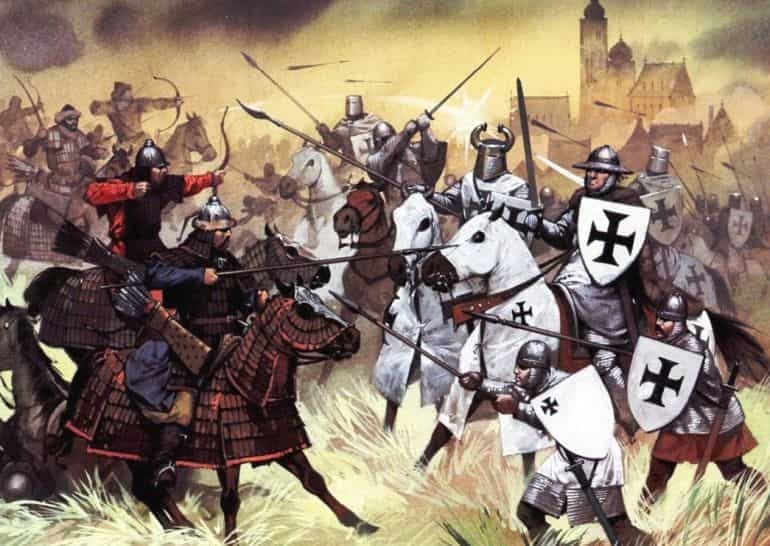 To drive the point home, the Mongols fought the Hungarians and Poles in 1241 AD on their western front, while also confronting the Koreans on their eastern side – thus ironically connecting the Far East with Eastern Europe through their own conquered realms. Suffice it to say, such extensive campaigns were driven by logistical elements and organizational skills, with the latter scope being based on the relatively simple yet efficient decimal system. To that end, the smallest unit of the Mongol army was known as the arban – with 10 men (commanded by a bagatur officer). Ten arbans made a squadron jagun, while 10 jaguns made a regiment minghan. Ultimately 10 minghans made the largest Mongol unit known to us – tumen. Thus each tumen consisted of 10,000 troops, and each Mongol army comprised two to three of such tumens. Essentially, these Mongol armies were commanded by their own great leader, and as such had their autonomous base of operations, command structure, and logistical lines – which allowed the Mongols to fight on multiple fronts. In fact, the divisions, by virtue of their autonomous status, didn’t even permit the transfer of men from one unit to the other – thus highlighting how the armies operated independently from each other. Furthermore, the troops were also recruited (or conscripted) across tribal lines, so that their loyalty would be focused on the Great Khan instead of their immediate clan leaders. 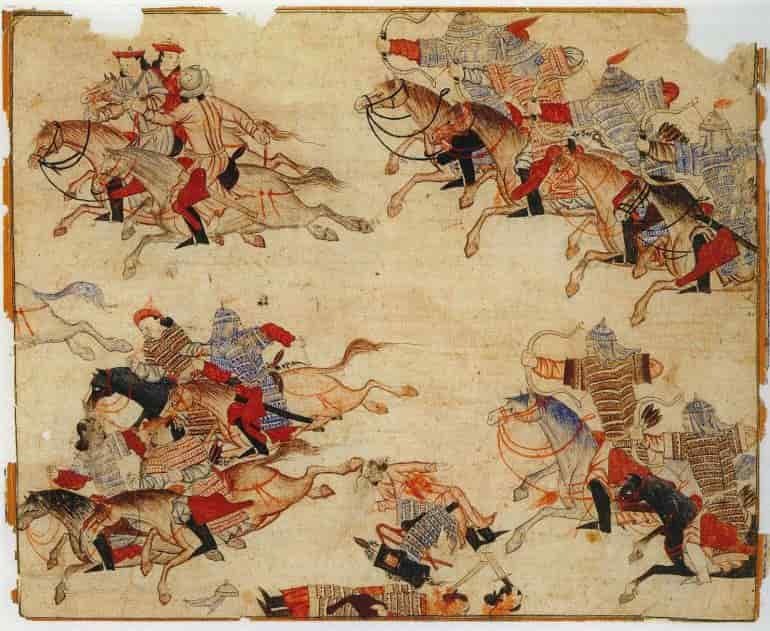 Talking of divisions, as historian Stephen Turnbull mentions, each Mongol army was composed of three main forces – the Junghar (East) – the Army of the Left Wing, Baraunghar (West) – the Army of the Right Wing, and Khol – the Army of the Center. The center force probably pertained to the Imperial Guard or the Keshik, and as such only recruited troops of the highest caliber (who proved their worth in battles and competitions) and pedigree (like sons of the minghan and jagun commanders). Much like the Hetairoi of Alexander the Great, the Keshik also functioned as a military academy in itself for future officers and commanders. And such was the prestige of the Imperial Guard that a fully-trained Keshik member held higher authority than the commander of a minghan of the other Left Wing and Right Wing forces. A popular notion relating to the Mongols pertains how their armies moved at rapid speeds. In that regard, without a doubt, the Mongols were more mobile than most of their contemporary foes – but the approach to battle was made with concerted efforts and dedicated plans. Simply put, a rapidly moving Mongol army (across a vast distance) could run the risk of exhausting its troops on the main battlefield. Moreover, there was the crucial consideration of logistics, like feeding their horses when moving cross-country. 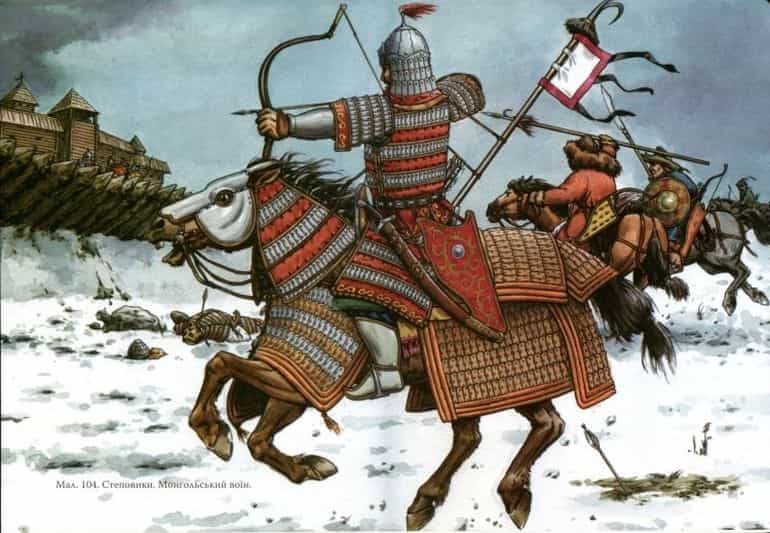 So instead the Mongol warriors opted for tactical mobility where different armies were utilized to cover strategic points, thus preferring effectiveness over speed. And even such maneuvers were planned well ahead by giving each commander precise instructions on which route to take and what time to arrive. And finally, when the armies did cover the distances and reached the battlefield or siege point, they demonstrated their remarkable mobility and speed in countering the foe. As for the numbers, Rashīd al-Dīn Ṭabīb, the 13th-century statesman and historian from Ilkhanate (southwestern part of the Mongol Empire, ruled by the house of Hulagu), mentioned how the entire Mongol army was around 123,000 – 129,000 strong during the death of Genghis Khan, circa 1227 AD. And within the realm of practicality, it is highly probable that the majority of these troops were mounted. Moreover, the army was bolstered by a slew other camp followers, suppliers, merchants, servants, and most importantly both horses and baggage animals. 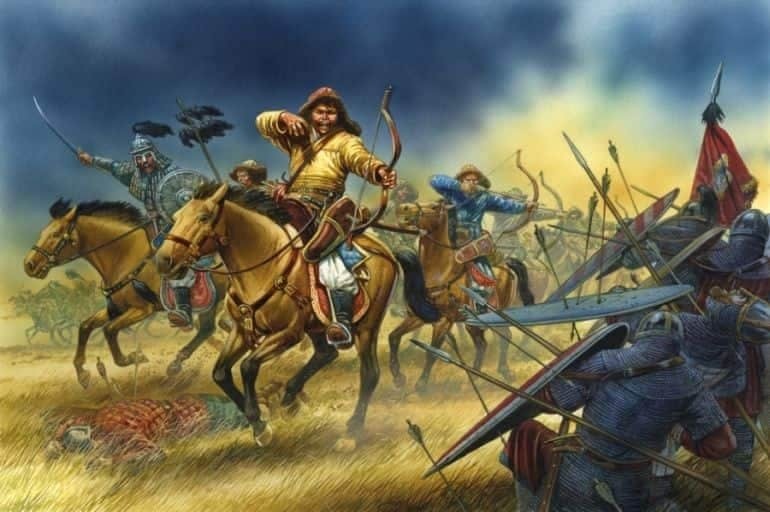 Just to provide an example, historian Stephen Turnbull mentioned (in The Mongol Warrior 1200 – 1350) how a tumen of 10,000 actual soldiers was accompanied by possibly 30,000 non-combatants and a whopping 600,000 animals of different kinds. Additionally, the overall Mongol army grew in numbers from the incorporation of recruits from conquered territories, ranging from Khorasan, Persia to Georgia. However, at the same time, the Mongol army didn’t operated as a singular entity – its forces were divided, with multiple tumens operating on vastly different and distant fronts (like Europe and Korea). 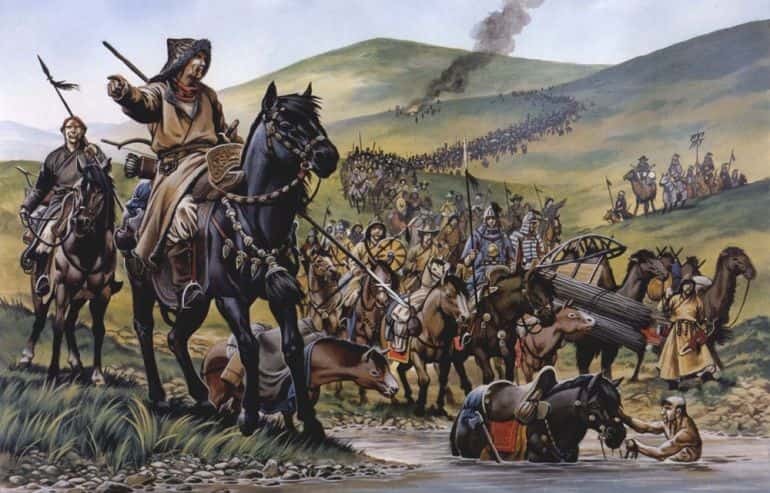 In fact, a common misconception pertaining to the Mongols (and most other nomadic forces) relates to their inflated numbers on a battleground. 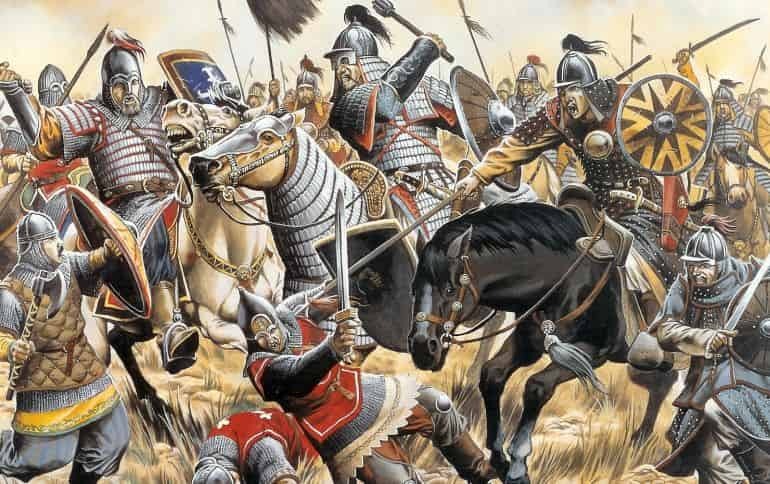 But unbiased studies have rather proven that the Mongols themselves were actually outnumbered in most of their famous victories, especially on European soil – including the Battle of the Kalka River, Battle of Mohi and even the Battle of Liegnitz. So why did such a misconception arise in the first place? Well, the answer partly relates to the fascinating tactical acumen of the Mongol soldier that preferred versatility and mobility over defensive maneuvers. Such fast battlefield actions and enveloping maneuvers rather befuddled many a European foe, thus giving them a false impression of Mongol numerical superiority. Moreover, the Mongol warriors themselves were partly responsible for creating an ‘effect’ of numerical superiority. There were occasions when stuffed dummies were mounted atop horses (a resource always available in great quantity to the Mongols) to form a notion of innumerable soldiers in their lithe horses. 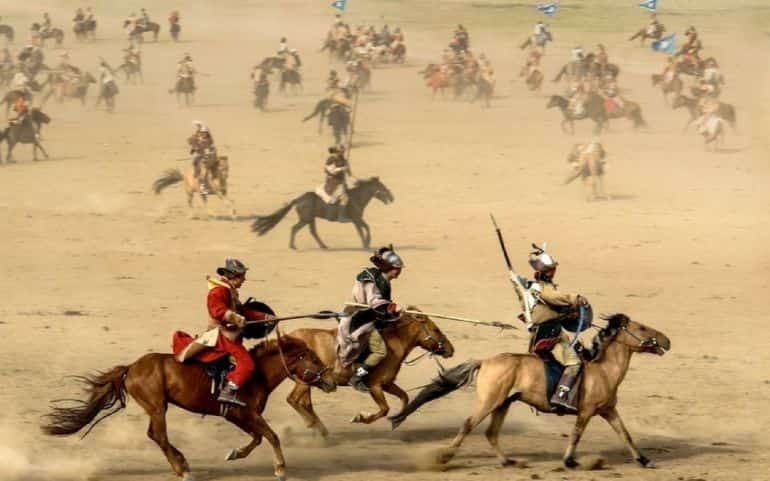 The Mongol warriors were also known to tie sticks to the horses’ tails that raised enormous dust clouds on their backs, which made the enemies think of huge Mongol reinforcements approaching the battlefield. In essence, it was often times propaganda and tactics magnified by the foe, a scope rather favored by the Mongols, that pushed forth the narrative of exaggerated numbers. For the Mongols, the war started much before their entry into the battlefield. Sir John Mandeville termed it as the ‘great dread’ – an incredible psychological and spying endeavor formulated to cripple the strategic (and sometimes political) advantages of the enemy. In that regard, the Mongol high command made immaculately detailed plans on how to infiltrate the enemy territory and gather first hand knowledge about their defensive systems, roads, crop lands, water supplies and even grazing lands. Spies were further recruited to plant dissension among the enemy warlords and kings. Propaganda was also used to entice the local population, with the Mongols projecting themselves as potential liberators to the poor people. [Then] they drove all the survivors, men and women, out on to the plain; and in order to avenge Toghachar it was commanded that the town should be laid waste in such a manner that the site could ploughed upon; and that in the exaction of vengeance not even cats and dogs should be left alive. Once again, such punitive actions of the Mongols were unquestionably savage. But on an objective level, steering clear of modern-day sensitivity, there was a deep psychological element to this scope of cruelty. Once again referring to the ‘great dread’ – the very essence of shock-and-awe, coupled with ‘reports’ of exaggerated numbers, could shake the enemy morale to its core. One of the rules for the Keshik clearly underlines how the commander of the entire guard unit of a military outpost must himself stand alongside his own soldiers for the night watch. And failure to do so would result in lashings of various degree, ranging from 30 to 70 strokes, while repeat offences even meant their total expulsion from the guard. Similarly, while on campaign, the Mongol officers were expected to inspect each and every soldier’s equipment under his command, and make sure that even their repairing gear (like needle and threads) were in order before a battle. And, while on march, the officer along with the next-in-line soldier were responsible for dismounting and picking up the gear accidentally left off by the preceding troop. Talking of battles, contrary to our popular notions of a ‘cacophony’ of horsemen hordes approaching the field, the Mongols, according to most contemporary sources, moved in deafening silence like a reticent menace, all in formidable order with dedicated standards ascribed to divisions. But once the men were arrayed in their positions, the ‘discord’ was unleashed with the beating of the naccara, the massive war-drums carried by camels. Almost mirroring their Hunnish predecessors, harsh and guttural sounds were thrown around, accompanied by screams and ‘layered’ charges of the light and heavy cavalry, while the orchestrated chaos was complemented by adroit horse-archers surrounding the enemy flanks. But as usual, there was a method to this madness, with the Mongols always preferring not to fully surround their enemies that could result in the opponent’s fatalistic attitude of fighting till the last man. Instead, they left passages of escape that provided the foes with the false hope of retreating – a doomed notion given the (general) superior mobility of the Mongol army. We have already talked about the innate skill of the Mongols when it came to the rigors of sustained warfare and battlefield tactics. In short, it was the discipline and tactical prowess of a Mongol soldier that set it apart from most contemporary forces. One particular incident epitomizes the Mongol zeal for victory even in conditions that were not conducive to their intrinsic mobility. We are talking about the forests of Burma, where a 12,000 strong Mongol army faced around 2,000 war elephants fielded by the native forces of the Pagan Empire in the late 13th century. According to Marco Polo (who covered the invasion from 1277-83 AD, in his travelogue Il Milione), while the Mongols themselves were undaunted by the prospect of facing these seemingly alien animals, their horses gave way to fear, and thus hesitated to move forward. But the commander was prepared for such an eventuality, and hence he ordered his mounted troops to dismount and tie their horses to the proximate bamboo trees. Finally, most of the Mongol warriors took out their stout composite bows and shot volleys of arrows at the approaching elephants. So what was proceeding to be an easy victory for the Burmese forces, turned into a rout with the penetrating arrows befuddling the giant animals; especially after concentrated volleys that were skillfully managed from the Mongol defensive positions. The meticulous preparation for campaigns on the part of the Mongols was rather mirrored by the bevy of items each of them was expected to carry. These objects included a small axe for cutting wood, a file for sharpening arrowheads, a lasso (usually made of horsehair), rope, needle and thread, a stitching awl, leather bottles, a small cooking pot, and a waterproof ration bag. A group of ten men (known as arban) also carried a tent. Beyond such items, the Mongols were also known for wielding different types of melee weapons on the battlefield, including maces for the heavy cavalry and sabers for their less-armored brethren. The front guard of shock cavalry, draped in heavy armor (discussed later), also carried their lances (sometimes with hooks and snares) for charging. Their posture usually involved being positioned high on the saddle with short stirrups for maximized momentum of the shock weapons. On the other hand, the assault infantrymen, often armored in a disparate fashion, carried their large wicker and wooden shields and adopted tortoise-like formations when approaching enemy walls and bastions. However, the weapon that is generally associated with the Mongols arguably relates to the composite bow – made from a glued ‘composite’ of yak horn, sinew, and bamboo, which was capable of delivering a pull of 75 kg (or 166 lbs) and had a substantial range of over 250 yards (230 m or 750 ft). 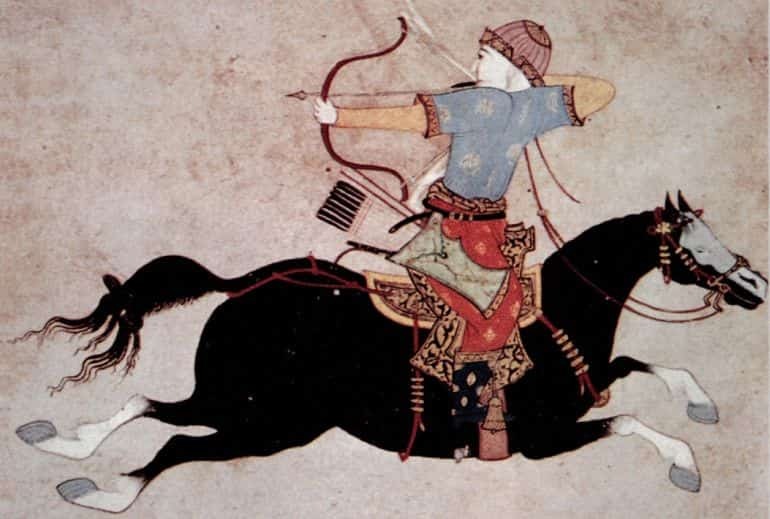 Furthermore, John of Plano Carpini had claimed that the Mongols carried two types of arrows – with the lighter ones used for long range firing and the broader, heavier ones used for close quarter missile attacks. To that end, the arrowheads were manufactured and treated with a special technique in which they were heated till red-hot conditions and then immediately plunged into salted water. This infused them with greater armor-piercing quality that was conducive to dealing with foes like the Khwarezmians and the Russians. The armor of the Mongols themselves can be a tricky subject, especially since even the eyewitness accounts dealt with styles that were unfamiliar to at least the Western observers. But like other contemporary armies of the period, leather-based armor was probably the common type of body-protection used by the regular Mongol troops (while some light cavalrymen armed with bows possibly eschewed any form of armor). Some of such armor types were made by fixing together pieces of hardened leather, with the material itself being made hardy (and weatherproof) by covering it in lacquer derived from pitch. As for heavier armor styles adopted by the shock cavalry of the Mongols, John of Plano Carpini mentioned the technique of piercing thin iron plates with toughened leather strings and then creating a coat of such partially-overlapping plates – thereby resulting in the lamellar armor. Some of these ‘metallic’ coats, worn over shorter robes, were brightly burnished and extended till below the knees. And during winter times, fur coats were rather worn over the lamellar or scale-based armor. Similarly, helmets were crafted from larger iron pieces, but they characteristically featured extended neck guards made of metallic bits. 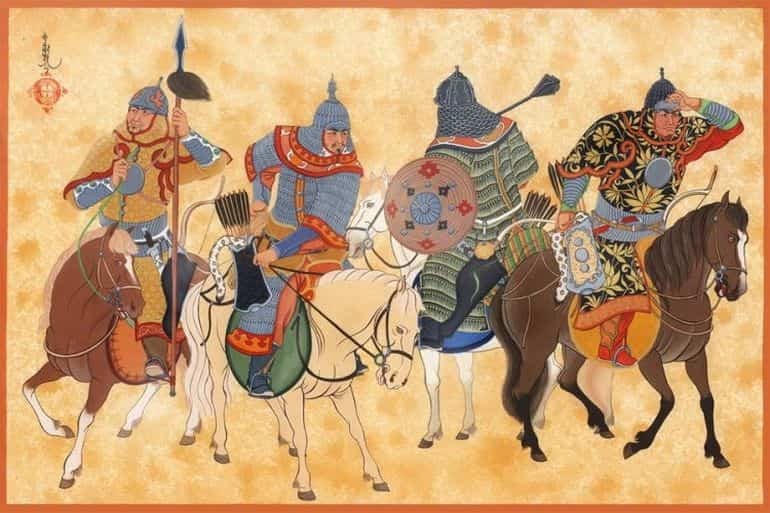 And lastly, while this particular topic is debated, it is not unlikely that (some) elite cavalry forces of the Mongol Empire wore silk shirts beneath their armor systems. And the reason went far beyond vanity. This is because, as opposed to popular notions, most of the harm by arrows was caused when the arrowhead was pulled out of the skin. So a layer of silk might have come in handy when its fibers twisted around the arrowhead, thus protecting (most of) the wound from the penetrative foreign object. Moreover, the Mongols were probably aware of silk’s anti-bacterial property when treated with dyes (or even turmeric). Obviously, this was not because of their perceived knowledge of the germ theory, but rather because of years of experience in warfare and wound treatment. When it comes to the major portion of military history, nomadic armies and wall settlements typically had a contentious relationship, given the former’s inability to commit to siege-based warfare and the latter’s capacity to defend itself against hordes of lightly-armed mobile forces (more suited to open battles). The Mongols, at the beginning of their campaigns, especially outside their traditional territories, also faced a similar predicament – the lack of expertise in sieges. To that end, under the leadership of Genghis Khan, the Mongol forces tended to focus their attention to the opponent’s field armies – which were destroyed in a piecemeal fashion, thus leaving the fortified settlements to be dealt with in the end. Then came the element of psychological tactics (as discussed earlier), failing which the Mongols resorted to siege. 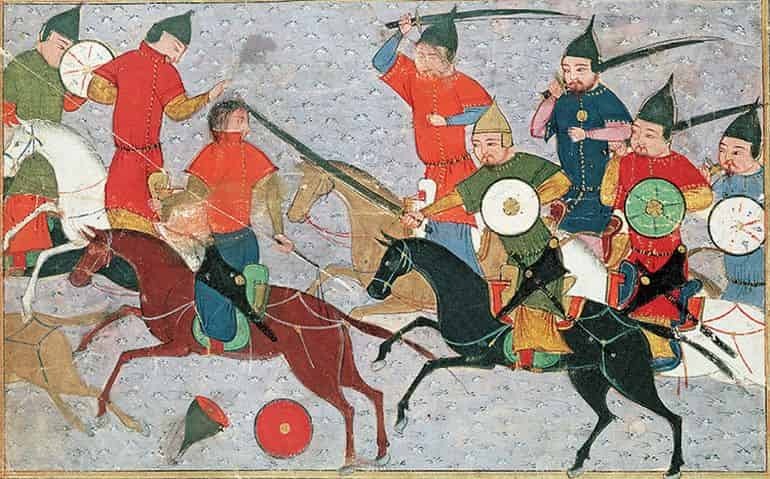 Interestingly enough, when it came to military matters, as opposed to haughty mindsets found in contemporary Islamic and European elite circles, the Mongols were well aware of their shortcomings in siege warfare. More importantly, they consciously made an effort to rectify their situation by employing both Chinese and Muslim experts in the field. In fact, Chinese-origin catapults, which were rather unfamiliar to Western observers – by virtue of their lever-based mechanisms, were gradually being adopted by the Mongols. These weapons made of oak, fired clay balls that would disintegrate on impact, while the ropes were crafted from a combination of both hemp and leather. 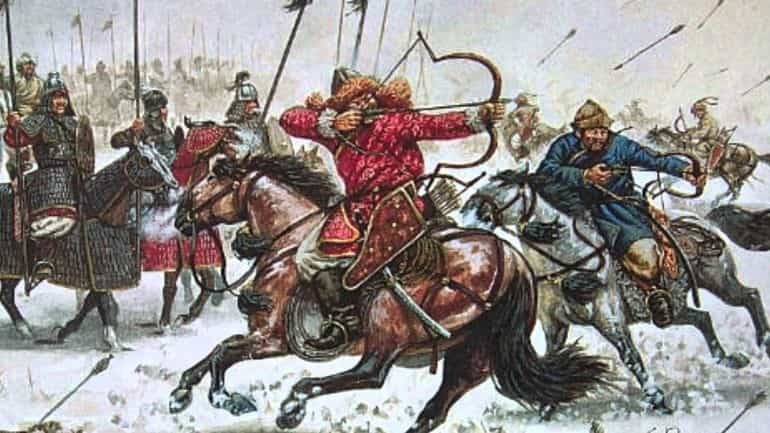 The Mongol armies were also known for using crossbow artillery, inspired by the Sung, that packed the punch of multiple crossbows in a single volley. Such siege projectile-firing machines were complemented by the trademark Mongol ingenuity. For example, in circa 1220 AD, their engineers used hardened mulberry tree blocks (water-soaked) as projectiles due to the unavailability of stones. 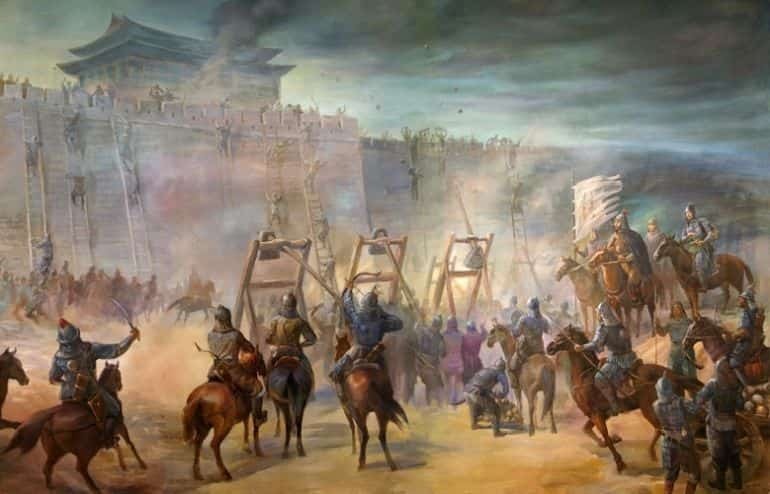 Similarly, during the infamous Siege of Baghdad in 1258 AD, the Mongols used both fire arrows and incendiary naptha pots as projectiles for their catapults, while in 1273 AD, Kublai Khan used Muslim-designed trebuchets from Iran for the siege of Hsiang-yang. Furthermore, according to historian Stephen Turnbull, beyond just inventive siegecraft, the Mongols also upped the scale of engagements by rigorous use of prisoners who would operate the large mechanisms in droves. Scores of such unfortunate captives were tasked with constructing on-site siege weapons within the range of the enemy firing line, as was the case during the siege of Nishapur in 1221 AD, when around a whopping 3,700 catapults were crafted just outside the besieged city on the orders of the Great Khan. Many of the captives were also forced to form assault teams who would march headlong into imposing walls and battlements with their ladders and mining equipment. 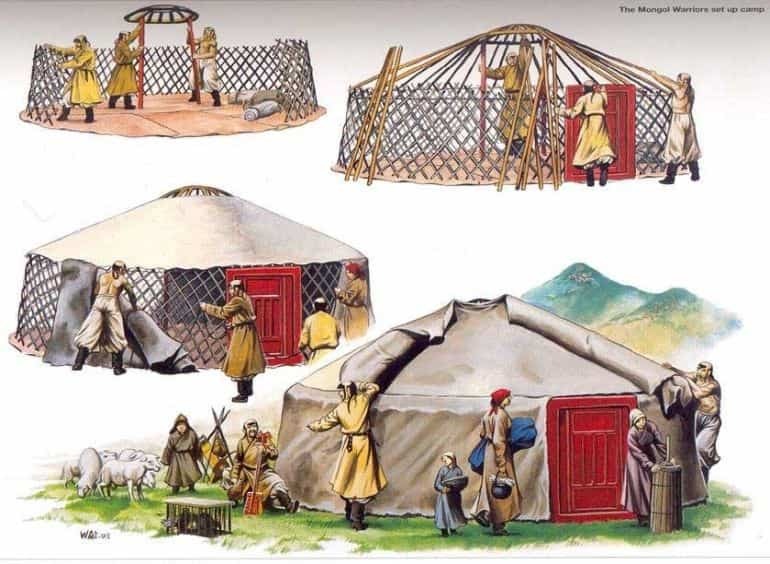 The ger, which is often incorrectly termed as the yurt, can easily be counted among one of the most practical pre-fabricated abodes that are still in usage. Basically, a circular-shaped habitat that is built upon a framework of wood covered snugly in insulating pelts, the protective structure was kept in place with the help of sturdy pegged ropes. Interestingly enough, an open-air recess is kept at the top apex-point of the circle for smoke release, while every entrance doorway faces south (which was considered sacred by the Mongols, so much so that anyone found blocking the doorway could have been sentenced to death). Even on the inside, the ger was spatially divided into men’s quarter, women’s quarter and a separate elder’s quarter – thus alluding to spatial efficiency and defined user circulation. And, in tune with the Mongol’s aptitude for mobility during military campaigns, the entire wooden framework (usually distributed among 10 men) could be folded and carried atop mules for speedy relocation from area to another. They have such a number of horses and mares that I do not believe there are so many in the rest of the world…the horse the Tartars ride on one day they do not mount again for the next three or four days, consequently they do not mind if they tire them out seeing they have such a great number of such animals. Other literary evidence suggests that each Mongol soldier probably had five to six mounts available to him (with some numbers even stretching beyond thirteen). Such incredible numbers were further bolstered by the innate level of stamina and hardiness showcased by the Mongol horses, with one medieval writer noting how a single horse could cover 600 miles in just nine days. Suffice it to say, the range could be significantly increased if the horses were cycled by a single rider, thus partly explaining the enhanced mobility of the Mongols, at least in a comparative scale. The Mongols were arguably at their apical stage of military power when they made their forays into Eastern Europe after 1240 AD. And by 1242 AD, they managed to heavily defeat Poland, Hungary, an assortment of knightly orders; and then proceeded on to invade Croatia. But almost like a miracle, the Mongol forces surprisingly decided to halt their push into Central Europe, and the main body of troops antithetically made their way back into Asia, thus leaving behind a trail of destruction and sordid legends. Now the most common hypothesis for such a hasty retreat on the part of the Mongols is usually attributed to the sudden death of Ögedei Khan, the Supreme Khan of the Mongols, who possibly met his demise after binge drinking at a hunting trip. However, recent research (headed by Nicola Di Cosmo, a historian at Princeton University) has shed some new light into this odd affair. And according to the study, the anticlimactic Mongol retreat was probably fueled by the abrupt weather effects on the local ecosystem, rather than some impractical ideal instigated by a distant leader’s death. Nicola Di Cosmo has talked about how the Mongols might have fielded almost 130,000 men in Europe, and they were possibly accompanied by half-a-million horses, circa 1240 AD. By April of 1241, they soundly orchestrated a string of defeats on Poland and its allies. And by the early months of 1242, the Mongols crossed into Hungary via the frozen expanses of Danube. Now historically in the very same year, the Mongols hastily retreated back, without incurring any major loss on the European battlefields – thus signifying a mystery related to their logistical scope. But as the researchers have deduced (with the aid of data gathered from tree rings), the particularly nasty winter rather helped in bringing about a wet spring in Hungary. This might have resulted in the grasslands of Hungary turning into marshes, which would have made them ineffective as grazing grounds for the very high number of Mongol ponies and horses. At its greatest extent, the Mongol Empire encompassed around 24 million square kilometers (9.3 million sq miles) – an area almost thrice the size of United States, thus creating the largest contiguous empire ever known to mankind. But even more remarkably, the vastness of their realm comprised an assortment of nations and ethnicities, ranging from Korea, China, parts of South-East Asia to Central Asia, Khorasan, Persia, Iraq, Georgia, Russia and even parcels of eastern Europe. But after Genghis Khan’s death, the Empire was already beginning to split, if not on purely political lines, but surely on ideological and cultural lines. One pertinent scope would relate to the general direction of the burgeoning empire in adoption of influence – with the proverbial ‘tug of war’ between sedentary values and nomadic legacy. Within this dilemma, the Toluid faction (originating from the youngest son of Genghis Khan) momentarily established its nominal supremacy in terms of gaining the throne of the Great Khan. 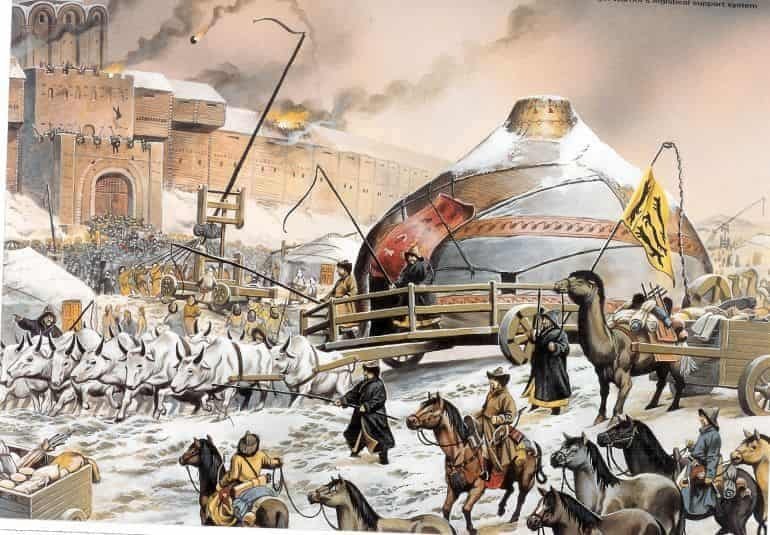 But by circa 1260 AD, the Mongols were plunged into a disastrous civil war that led to the splintering of the concerted military capability of the empire, while also eroding the core political force that united the Mongols in the first place. And finally, after the death of Kublai Khan (who was formally accepted as the fifth Khagan or Great Khan of the Mongols) in 1294 AD, the empire fractured into fourth major blocs – the Golden Horde (based in Eurasia), the Chagatai Khanate (based in Central Asia), the Ilkhanate (based in Persia), and the Yuan Dynasty (based in China); each with its own cultural ecosystem (as a result of decades of native influence). And while in 1309 AD, the Khanates temporarily united under the Yuan, by 1368 AD (when Yuan was replaced by the Chinese Ming), the flimsy ties were unceremoniously severed in favor of independent Mongol (or Mongol-influenced) empires and kingdoms that ranged from Asia to the confines of Europe.